Last night, CompStak's data was featured in The Wall Street Journal. As a result of both the comps we've received from our NYC users and our dedicated analysts, we were able to provide some stats to such a renowned publication. Yeah, we're pretty pumped about it. When Yahoo YHOO +0.34% decided to expand its Manhattan offices, the Internet giant didn't take space near Madison Square Park, in the Meatpacking district or any of the other favorite locales of the city's burgeoning technology sector. Rather, late last month Yahoo announced plans to move its 500 New York-based employees to the Times Square area. The company has signed a 10-year lease for 176,000 square feet in the former New York Times headquarters, according to Compstak Inc., a real-estate data firm. New York's tech industry is on the move. Once located primarily in Midtown South, it's colonizing other parts of town including the Times Square area, the Garment District and downtown. 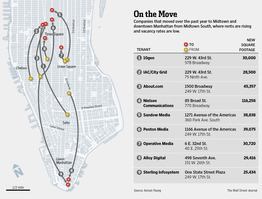 Companies that have relocated from Midtown South to downtown or Midtown in the past year include About.com, Nielsen Communications, 10gen and Sandow Media. The main reason: falling vacancies and rising rents in the Midtown South area. Midtown South's rent growth over the past decade averaged 7.9%, while in Midtown the increase averaged only 3.1%, according to a new research report from Avison Young. The rent trend is expected to continue. Indeed, Avison Young predicts that average rents for Midtown South's highest quality, or "Class A," space will surpass $70 a square foot this year. That puts rents on track to surpass average rents in Midtown's Class A space this year, Avison Young says. "Persistent demand from the technology and new media companies coupled with a lack of available space and high prices in Midtown South have created opportunities for other neighboring submarkets," the report states. To be sure, Midtown South only has 17.4 million square feet of Class A space, compared with 169 million in Midtown and 70 million square feet Downtown. Also, some buildings in Midtown charge well over $100 a square foot. But even rents in humdrum buildings in Midtown South have been rising, with some buildings in the Meatpacking District and West Chelsea, such as 837 Washington St., asking $100 a square foot rents. Yahoo will pay $68 a square foot and then its rent will increase to $73 a square foot after five years, according to Compstak. The technology company also will get 18 months of free rent as part of the deal and interior construction worth $65 a square foot, Compstak says. Midtown South used to be where businesses went when they were priced out of Midtown. But this began to change in the 1990s as the tech sector got hot and startups were lured up to the area by the low rents, unusual space and the hip neighborhoods. The office vacancy rate in Midtown South was 9.1% at the end of the first quarter of this year, compared with 12% in Midtown and 13.5% downtown, according to Avison Young. Looked at another way, in Midtown South, there are only four Class A buildings with blocks of over 100,000 square feet available. In Midtown there are 39 such buildings and in Downtown there are 22, the firm says. Now the migration is heading out of Midtown South. The garment district already is benefiting, says Greg Kraut, an Avison Young managing director. "We are now seeing very mainstream names moving to the garment district, and it's no longer just fabric stores," he says. Within the next two to five years, Avison Young sees media and tech firms seeking space also relocating along Third Ave in Midtown and Water Street in Downtown. The real-estate firm predicts that the Hudson Yards development on the West Side also will become popular with tenants currently in Midtown South.